Famous Japanese Ukiyo-e artist, Ando Hiroshige (1797 – 1858) is known for his poetic interpretations of ordinary landscapes. Assuming his father’s firefighting job when he was orphaned at age 12, Hiroshige was inspired to become an artist when he saw the works of the rennowned Hokusai. Starting out as a protrait artist, he ultimately achieved fame for his landscapes. His artwork, including his masterpiece, “Fifty-Three Stations of the Tokaido,” used unique perspectives, bold colors and realistic depth. When tourism boomed, Hiroshige was inspired by his own travels to create an incredible 5,400 prints. 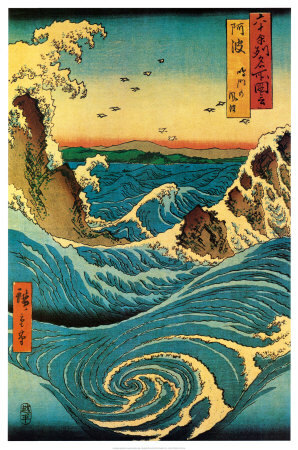 Hiroshige (1797-1858) was a member of the Utagawa school, along with Kunisada and Kuniyoshi. The Utagawa school comprised dozens of artists, and stood at the forefront of nineteenth century woodblock prints. Particularly noteworthy for their actor and historical prints, members of the Utagawa school were nonetheless well-versed in all of the popular genres. During Hiroshige’s time, the print industry was booming, and the consumer audience for prints was growing rapidly. Prior to this time, most print series had been issued in small sets, such as ten or twelve designs per series. Increasingly large series were produced to meet demand, and this trend can be seen in Hiroshige’s work, such as The Sixty-nine Stations of the Kisokaid? and One Hundred Famous Views of Edo.